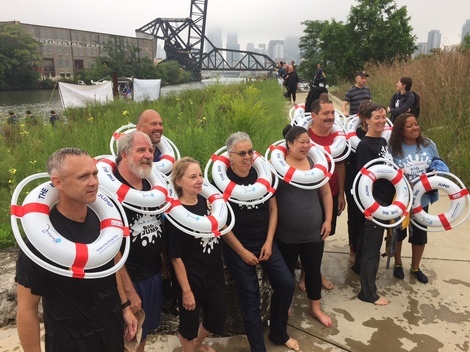 Elected officials and river advocates swam in the Chicago River Saturday, August 25 in a “Big Jump” event designed to highlight the collective work that has been done to improve the river’s water quality and to demonstrate a commitment to making the Chicago River swimmable for all. 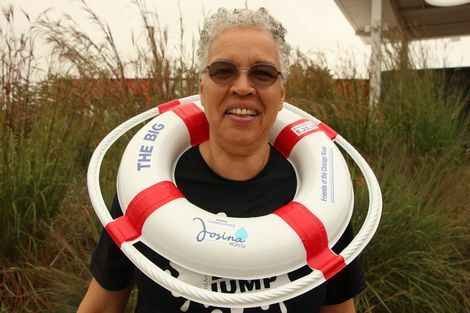 Organized by Metropolitan Water Reclamation District Commissioner Josina Morita and Friends of the Chicago River, the 2nd “Big Jump” event took place at Ping Tom Memorial Park and included Cook County Board President Toni Preckwinkle, Cook County State’s Attorney Kim Foxx, Congresswoman Robin Kelly, Ald. 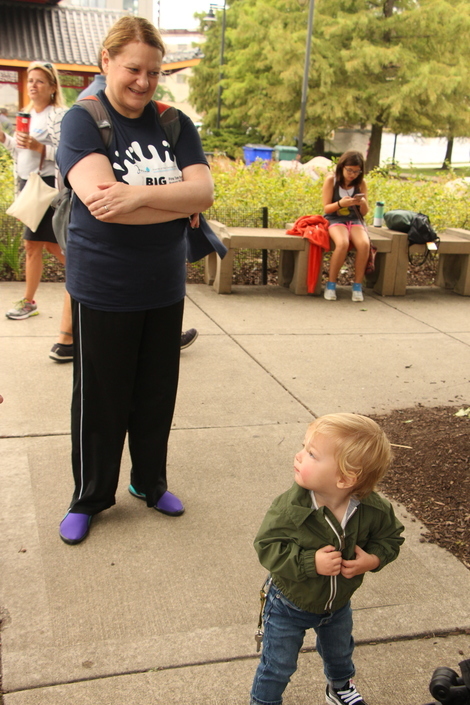 Michelle Smith (43rd) and State Rep. Robyn Gabel of the 18th District among others. “The river is a recreational resource. The river is alive with wildlife. And the river belongs to all of us. We need to celebrate the river, protect the river and ensure that all Chicagoans can access it and enjoy it,” said Frisbie. “The district over 100 years ago used to dump raw sewage into the river. We now disinfect water from our O’Brien and Calumet plants that is cleaner than river water. 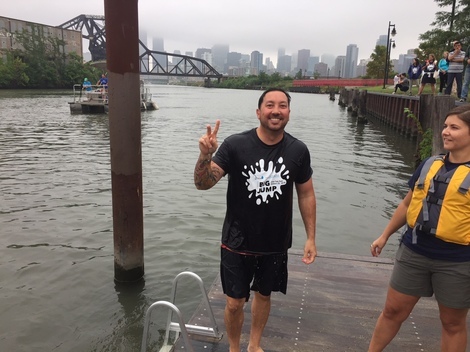 All of us here today share the goal of ensuring that the Chicago River becomes swimmable for everybody someday,” said Morita. “It’s come full circle to be here today to see what has happened to the river over the course of several decades. Access to the river is something young people from neighborhoods like the one I grew up in need to have,” said Foxx. 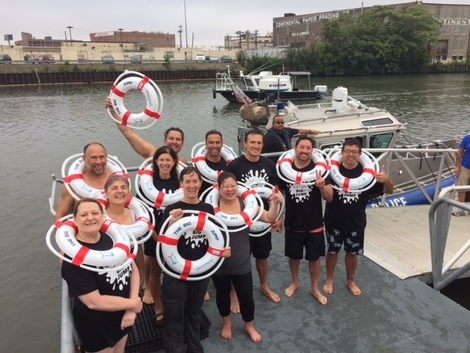 There has been a great deal of improvement to the water quality in the Chicago River system including the Tunnel and Reservoir Plan (TARP, aka Deep Tunnel) and new water quality standards that include disinfection at the O’Brien and Calumet Plants which discharge to the river. 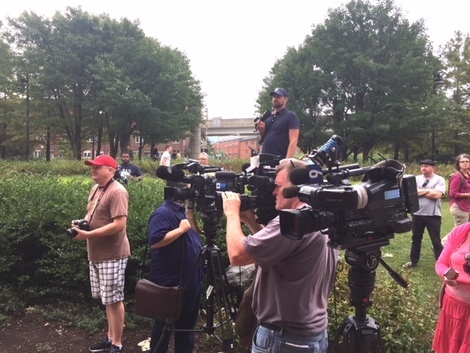 According to the Metropolitan Water Reclamation District, with disinfection in place the water they are releasing into the river is cleaner than the river water itself. 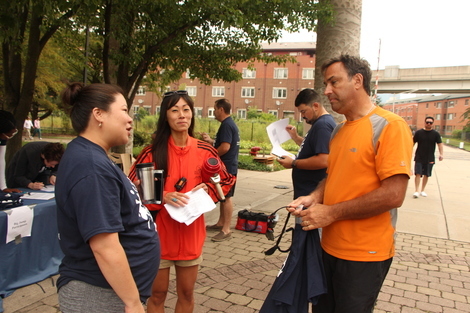 The water quality station nearest to the Ping Tom Park river area is often lower than the IEPA target for the Primary Contact Recreation waters, and tests have shown no human pathogens. In other words, the water is safe for people with normal immune systems. 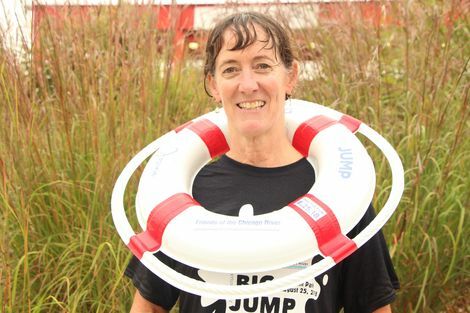 Funds raised by the jumpers benefit the Chicago River Schools Network, Friends of the Chicago River’s watershed-wide education programming connecting students to the river. 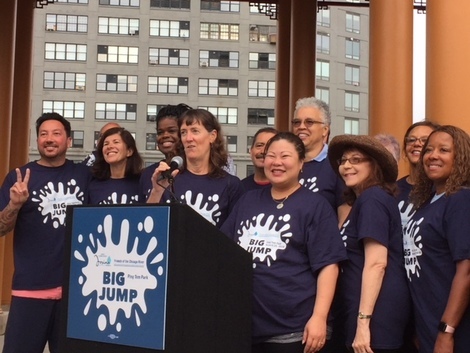 Friends of the Chicago River Executive Director Margaret Frisbie and Metropolitan Water Reclamation District Commissioner Josina Morita led a press conference ahead of the "Big Jump." 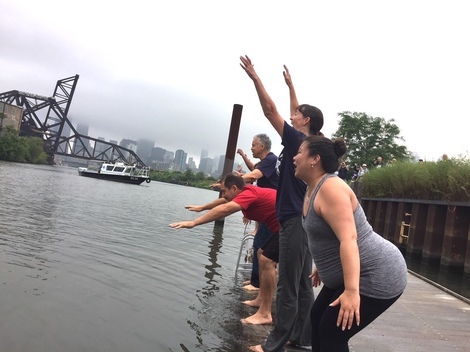 MWRD Commissioner Morita, Friends' Frisbie, Cook County Commissioner Chuy Garcia and Cook County Board President Toni Preckwinkle get ready to jump into the Chicago River at Ping Tom Park. Commissioner Morina, who is pregnant, joked "I'm jumping for two." 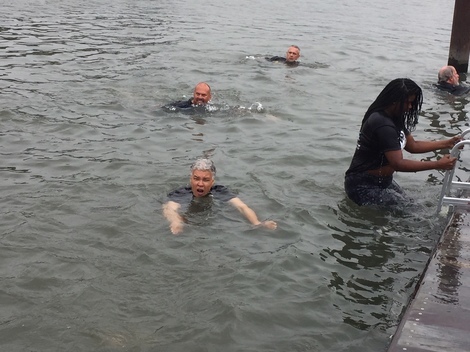 President Preckwinkle (center) and Cook County State's Attorney Kim Foxx emerge from the river. Nobody really needed any life preservers. 104.3 JAMS afternoon host Sean "Sonic" Leckie with Friends' Tributary Committee Chair Louise Barrett. Learn more about the Tributary Commitee here. We salute you! Col. Aaron Reisinger, commander, U.S. Army Corps of Engineers, Chicago District. Cook County State's Attorney Foxx. Thanks to these generous folks who helped raise money for Friends. 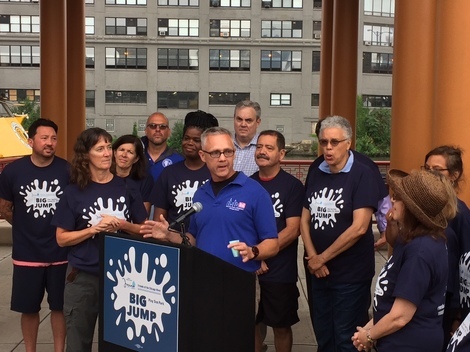 Donors for the Big Jump included Judith Bassoul, Mike Borgstrom, Cam Davis, Noreen Ellis of Knight Engineering, Lydia Kelley, Bob Mack of Knight Engineering, Don Macdonald, Doug McConnell, and Luis Montegomery of 2iM Engineering. 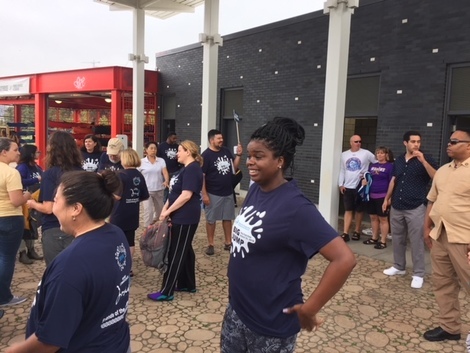 And thanks to CBS2, NBC5, ABC7, WGN9, FOX32, CLTV, WGN radio, WBBM Newsradio and the Chicago Sun-Times' Dale Bowman for the coverage. Also, to Mike Borgstrom of Wendella for providing a boat for the cameramen to film the jumpers from the river. OK, Sonic. How was it?